Kodak Alaris “12 Days of Giveaways” Sweepstakes – Win an iPhone 6! Win an iPhone 6 (12 winners)! 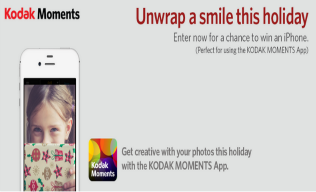 ENTER SWEEPSTAKES HERE – Kodak Moments Facebook page. ENTRY LIMIT – Limit: One (1) entry per person or email address per day during the Sweepstakes Period regardless if entrant has more than one (1) email address. ELIGIBILITY – TheSweepstakes is open to legal residents of the 50 United States, including the District of Columbia, age 18 or older at the time of entry. SWEEPSTAKES ENTRY PERIOD – The Kodak Alaris “12 Days of Giveaways” Sweepstakes begins at 12:00:01 AM Eastern Time (“ET”) on Friday, November 27, 2015 and ends at 11:59:59 PM ET on Tuesday, December 8, 2015. PRIZES – Grand Prizes: There will be twelve (12) Grand Prizes available to be won of one (1) iPhone® 6. ARV: $549 each. 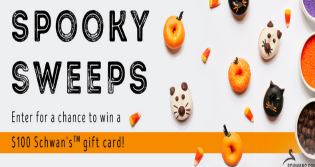 Schwan’s Spooky Sweepstakes – Win a $100 Schwan’s gift card! Win a $100 Schwan’s gift card! ENTER SWEEPSTAKES HERE – Schwan’s Facebook page. ENTRY LIMIT – Limit of one (1) entry via the registration and a maximum of ten (10) additional entries via the share mechanism for a maximum limit of eleven (11) entries per person using only one (1) email address throughout the Sweepstakes Period. ELIGIBILITY – Sweepstakes is open to legal residents of the fifty (50) United States and the District of Columbia, who are at least 18 years of age at time of entry. SWEEPSTAKES ENTRY PERIOD -Spooky Sweepstakes starts on October 5, 2015 at 9:00 am Central Time (“CT”) and ends on October 31, 2015 at 11:59pm CT.
PRIZES – GRAND PRIZE (1): A $100 Schwan’s gift card. Approximate Retail Value (“ARV”) of Grand Prize: $100. 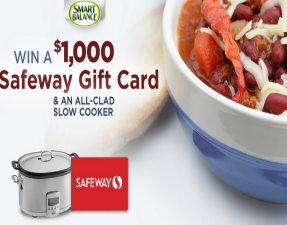 Smart Balance Sweepstakes – Win a $1,000 Safeway gift card & more! Win an All-Clad Slow Cooker and a $1,000! ENTER SWEEPSTAKES HERE – Smart Balance Sweepstakes page. ENTRY LIMIT – Entry is limited to one (1) submission per day per entrant. ELIGIBILITY – The Smart Balance Promotion is open to all legal residents of the U.S. who are at least eighteen (18) years of age at the time of entry. SWEEPSTAKES ENTRY PERIOD – The Promotion will begin at 8:00am Pacific Time(“PT”) on September 1, 2015 and end at 10:00pm PT on September 30, 2015. PRIZES – One winner of the Standard Prize will receive one All-Clad Slow Cooker not to exceed $350.00 and a Safeway gift card good for $1,000. The total dollar value for the Prize is $1,350.00. 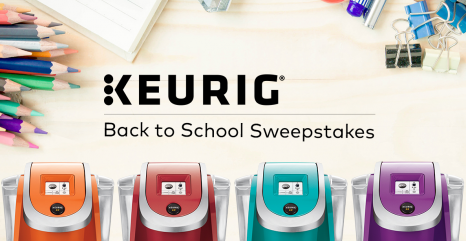 Keurig Back to School Sweepstakes – Win a Keurig Brewer! Win a Keurig 2.0 K250 Brewer! 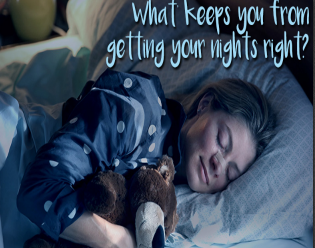 ENTER SWEEPSTAKES HERE – Keurig Facebook page. ELIGIBILITY – The Sweepstakes is open only to legal residents of the United States (DC), who are eighteen (18) years of age or older at the time of entry. SWEEPSTAKES ENTRY PERIOD – The Keurig® Back to School Sweepstakes begins on Wednesday, August 19, 2015 at 10:00:00 a.m. (Eastern Standard Time) and ends on Thursday, August 27, 2015 at 11:59:59 p.m. (Eastern Standard Time). The Breathe Right Instant Win Game – Win a $100 Bed Bath & Beyond gift card! Win a $100 Bed Bath & Beyond digital gift card (27 winners)! ENTER SWEEPSTAKES HERE – Breathe Right Nasal Strips Facebook page. ENTRY LIMIT – Limit one (1) game play per person using only one (1) email address per calendar day throughout the Promotion Period. ELIGIBILITY – Promotion is open to legal residents of the fifty (50) United States and the District of Columbia, 18 years of age or older. PRIZES – Twenty-seven (27): A $100.00 Bed, Bed & Beyond digital gift card. Approximate Retail Value (“ARV”): $100.00 each. Fifty-three (53): A $50.00 Bed, Bed & Beyond digital gift card. Approximate Retail Value (“ARV”): $50.00 each. One hundred (100): A $20.00 Bed, Bed & Beyond digital gift card. Approximate Retail Value (“ARV”): $20.00 each. Dr. Praeger’s Picnic Pack Facebook Sweepstakes -Win a Cuisinart Tabletop gas grill & more! Win a Cuisinart Tabletop gas grill, picnic basket & more! ENTER SWEEPSTAKES HERE – Dr. Praeger’s Facebook page. ENTRY LIMIT – Limit to one (1) entry per person. ELIGIBILITY – The Sweepstakes is open to legal U.S.residents residing in any of the 50 United States and the District of Columbia,who are 18 years of age or older and have a unique, personal and valid social security/identification number at the time of entry. 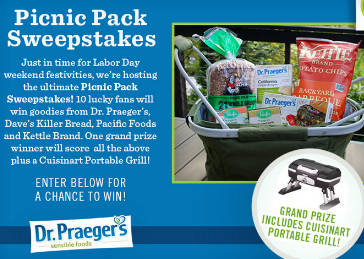 SWEEPSTAKES ENTRY PERIOD – The Dr. Praeger’s Picnic Pack Facebook Sweepstakes begins at 1:00 p.m. Pacific Time (PT) on August 19, 2015 and ends at 11:59 p.m.Pacific Time (PT) August 26, 2015. PRIZES – GRAND PRIZE: One (1)Cuisinart Petit Gourmet Portable Tabletop Gas Grill, one (1) Insulated PicnicBasket, two (2) bags Kettle Brand Chips, one (1) box Pacific Foods Vegetarian BakedBeans, one (1) box Pacific Foods Original Hummus, one (1) loaf Dave’s KillerBread 21 Whole Grains and Seeds, and three (3) coupons for one (1) free Dr.Praeger’s product. Total prize value is $177.00. FIRST PRIZE: One (1) InsulatedPicnic Basket, two (2) bags Kettle Brand Chips, one (1) box Pacific FoodsVegetarian Baked Beans, one (1) box Pacific Foods Original Hummus, one (1) loaf Dave’s Killer Bread 21 Whole Grains and Seeds, and three (3) coupons for one(1) free Dr. Praeger’s product. Total prize value is $75.00. 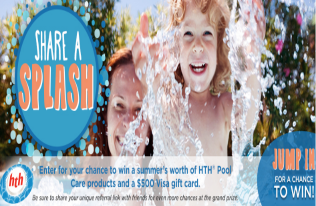 HTH® Pool Care Share-a-Splash Contest – Win a $500 Visa gift card & more! Win a $500 Visa gift card and HTH Pool care products! ENTER SWEEPSTAKES HERE – HTH Pool Care USA Facebook page. ENTRY LIMIT – Limit: One original entry per email address and per person during the Promotion Period. Additional entries are earned only through additional participants entering through the referral link. There is no limit on the number of additional entries earned through referrals. ELIGIBILITY – The Contest is open only to legal residents of the 50 United States, and the District of Columbia who are eighteen (18) years of age or older at the time of entry. SWEEPSTAKES ENTRY PERIOD – The Contest begins on Wednesday, July 8 at 9:00 a.m. (Eastern Daylight Saving Time) and ends on Wednesday, August 19 at 11:59:59 p.m. (Eastern Daylight Saving Time). PRIZES – On August 20th one (1) grand prize with a total retail value of $800, including one (1) $500 Visa Gift Card and an assortment of HTH® Pool Care Products with a retail value of approximately $300 (the “Grand Prize”) will be awarded to the contest winner. 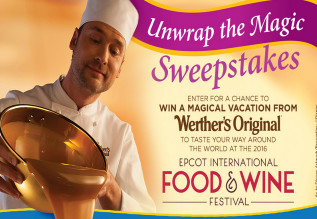 Werther’s Unwrap the Magic Sweepstakes – Win a trip to Walt Disney World! Win a trip to Walt Disney World & more! ENTER SWEEPSTAKES HERE – Werther’s Facebook page. ENTRY LIMIT – Limit two (2) Entries per person/email address per Day – one (1) entry form and one (1) correct/complete word scramble. ELIGIBILITY – Unwrap the Magic Sweepstakes is only open to legal residents of the fifty (50) United States and the District of Columbia who are 18 years of age or older at the time of entry. SWEEPSTAKES ENTRY PERIOD – The Sweepstakes begins at 12:00:00 pm noon Eastern Time (“ET”) on August 10, 2015 and ends at 11:59:59 am ET on November 15, 2015. PRIZES – Weekly Prize (14): Each weekly Winner during the 14 weeks of the Entry Period will receive a Werther’s Caramel Gift Basket containing (i) Werther’s product, (ii) an autographed Gail Gand Cookbook, and (iii) a $25 Disney gift card. Approximate Retail Value (“ARV”) of one weekly prize is $75.00. Gift card is subject to certain terms and conditions as specified by issuers. Limit one (1) weekly prize per person/household. 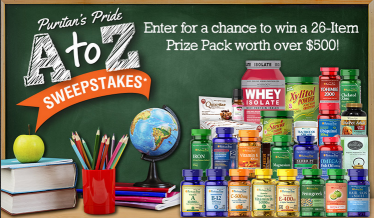 Puritan’s Pride ‘A to Z’ Sweepstakes – Win a vitamin prize pack worth $500! Win a vitamin prize pack worth $500 (4 winners)! ENTER SWEEPSTAKES HERE – Puritan’s Pride Facebook page. ENTRY LIMIT – Limit one entry per person per day during the Sweepstakes Period. ELIGIBILITY – Puritan’s Pride ‘A to Z’ Sweepstakes is open to legal residents of the 50 United States and Washington, D.C., who are 18 years of age or older at the time of entry. SWEEPSTAKES ENTRY PERIOD – The Sweepstakes begins at 10:00 a.m. Eastern Time (“ET”) on August 10th, 2015 and ends at 5 p.m. ET on September 10th, 2015.